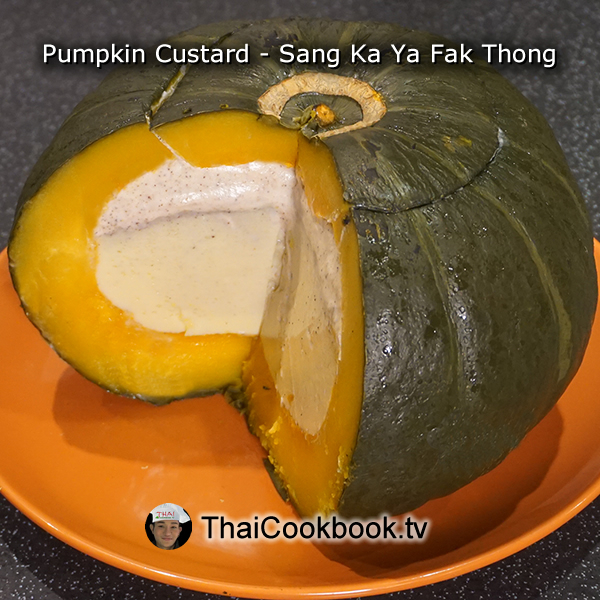 The pumpkin custard known as San Ka Ya is a popular Thai street food snack that can be purchased from vendors by the slice. When served whole and sliced at the table it makes a nice dessert for any type of meal. 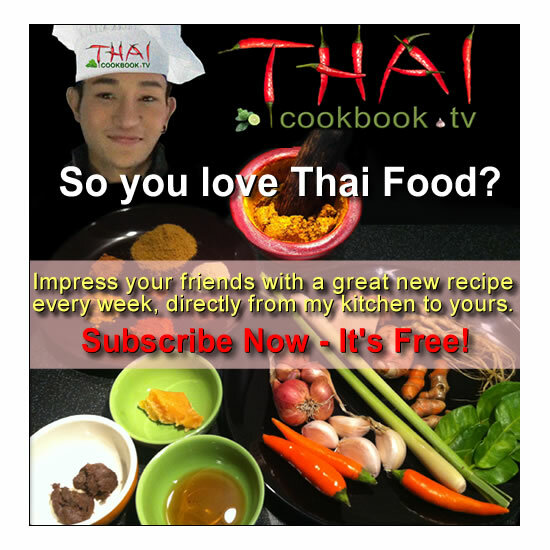 Watch as we show you how easy it is to make this interesting and very authentic Thai food for your next party, dinner, or to keep in the frig for a nice treat. 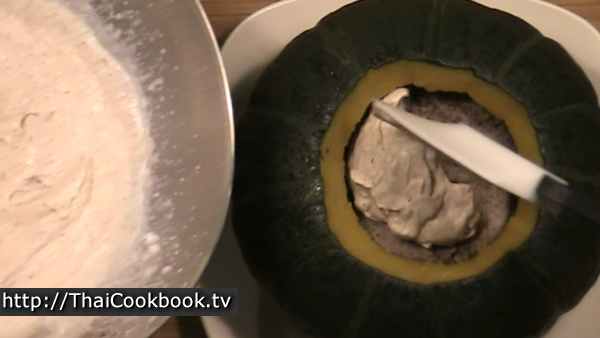 For this demonstration we used a kabocha squash, also known as the Japanese pumpkin. It is very similar to the Buttercup squash, and has a firm green skin, a strong and delicious sweet flavor, and moist, fluffy texture. What's in our Pumpkin and Coconut Custard. How we make our Pumpkin and Coconut Custard. 1) Cut a top whole in the pumpkin and remove all the seeds and pulp. Save the top to be replaced after cooking. 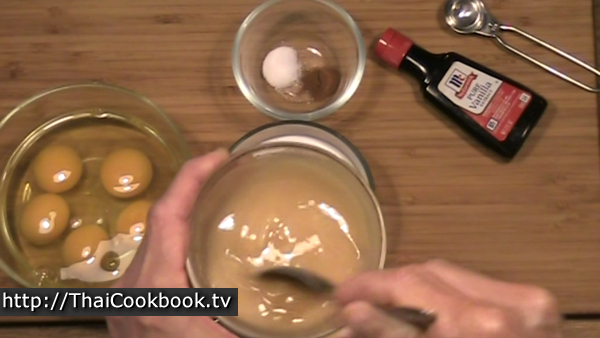 2) Prepare the custard by whisking egg, sugar, coconut milk, cinnamon, salt, and vanilla. Pour it into hollowed out pumpkin. 3) Cook on high heat in a vegetable steamer for at least an hour. Allow to cool completely. 4) Prepare whipped topping. Spoon into the top of the custard or serve it as a topping. Slice the whole pumpkin as you would a pie. 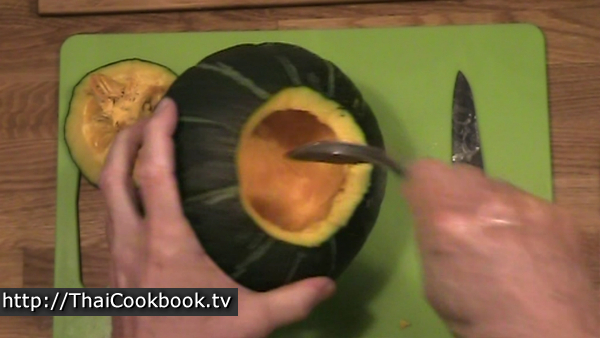 Using a sharp knife, cut a hole in the top of the pumpkin, keeping the cutout top in one piece. Be sure to cut the whole big enough to get your hand inside. Use your hand, and then a spoon to remove all the seeds and stringy membrane so that the pumpkin is smooth and clean inside. If using the type of coconut sugar that comes in large pieces, you'll need to soften it up so it can blend in to the custard. I put it in a small bowl with a little water and microwave it for about a minute. After heating, it will mix up into a nice syrup. If you are using granulated sugar you can skip this step. 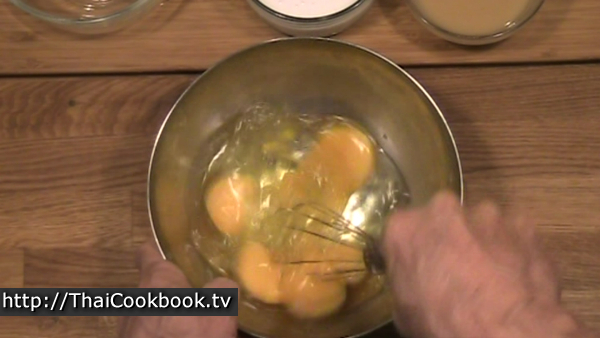 Whisk the egg lightly, then whisk in the sugar until they are well blended. Next add the cinnamon, salt, and vanilla extract. Stir it up well, then add the coconut milk. Whisk lightly until everything is smooth and creamy. 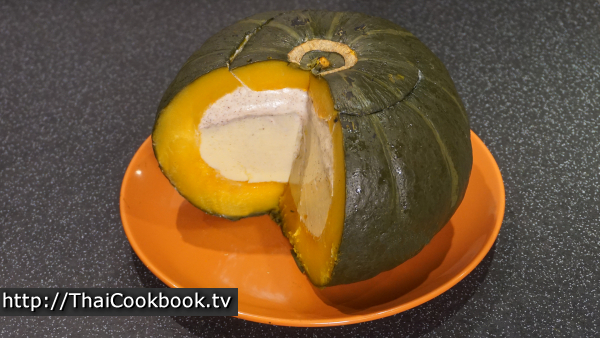 Pour the custard into the hollowed out pumpkin. 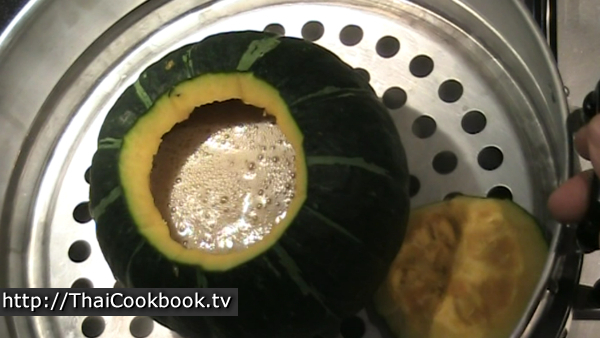 Place the pumpkin in a large steamer. lay the top piece on the side so it cooks also. Cover tightly and steam for about 45 minutes or more. 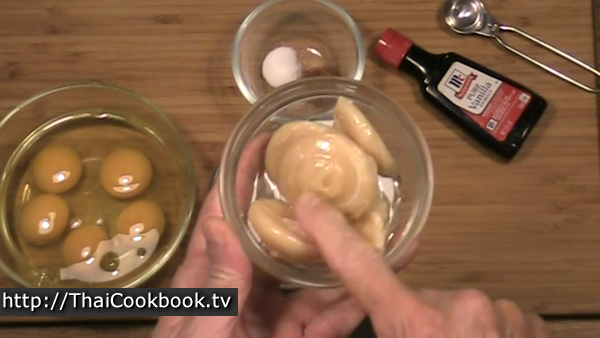 After steaming, the custard will expand and get firm. You need to be sure that it has cooked long enough. 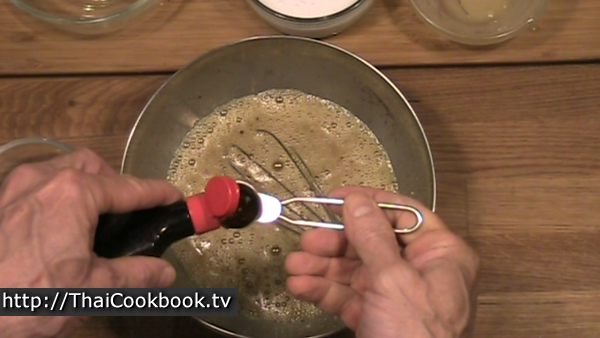 You can check the internal temperature with a meat thermometer. It will need to be at least 75° C or about 165° F to be fully cooked. You can also stick it with a toothpick to check that it is firm. This custard ended up taking about 1 hour to cook. 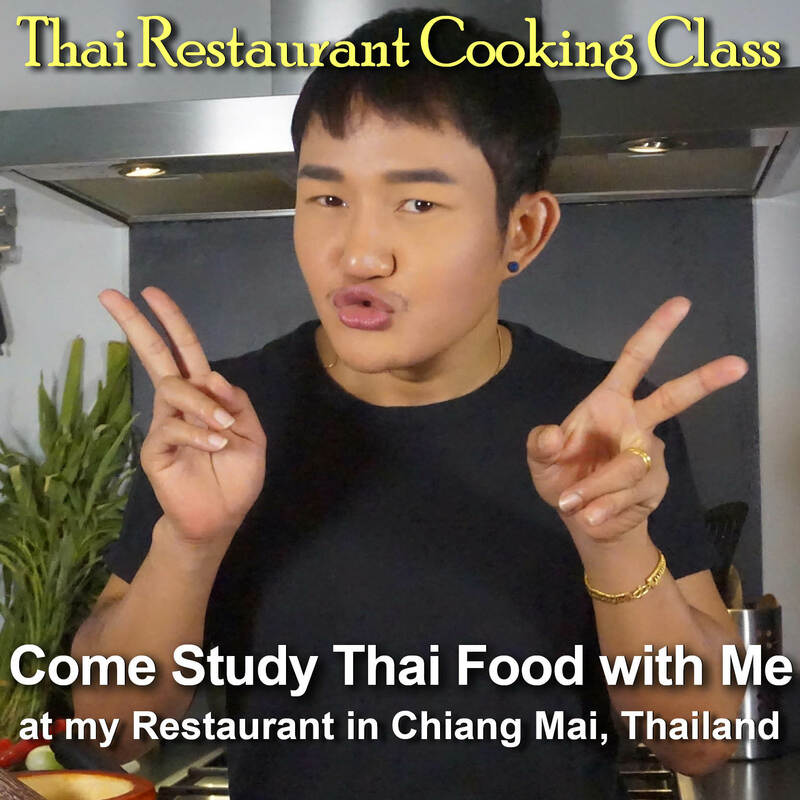 The one thing you do not want to do is stop cooking while it's still too soft. Remove it from the steamer and let it cool to room temperature, then refrigerate until very cold. After it cools the custard will contract, usually leaving a space at the top. I'll fill this with some whipped cream. 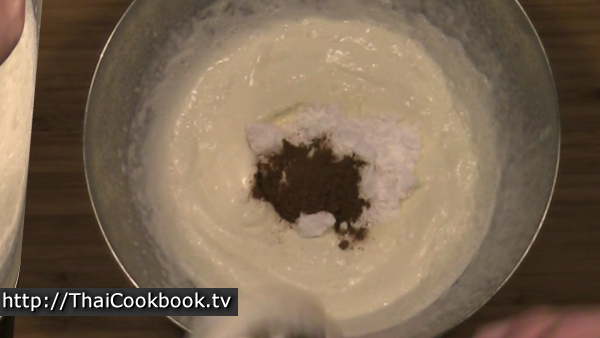 Whip the heavy cream until it's very thick and peaks form. Add the sugar, cinnamon, and nutmeg. beat it on high until well mixed and firm again. Spoon the cream into the open space and pack it in well. Replace the top as a lid and push it into the cream tightly. If your custard doesn't have space for the cream, you can skip it for the more traditional way that is without cream, or you can serve it on the side as an optional topping. Return it to the refrigerator until time to serve so it stays very cold. To serve, slice it like a piece of pie. Cover the unused portion well with plastic wrap and keep refrigerated. It will last several days if kept very cold.